Ohmygod!!!! Jurassic 5 have dropped a seriously crafted follow-up to their Interscope debut, Quality Control. This time around they've eased back on their old-school unison style and have quickened up the pace, resulting in a solid pick for the late end of the year. Also comes with a bonus DVD of some live footage. Production: 1, 4, 5, 6, 9, 15 by Cut Chemist except: 2, 7, 8, 10, 11, 12 DJ Nu Mark, 3, 13 Juju of the Beatnuts, 14 SA-RA Creative Partners, 16 DJ Nu-Mark & Cut Chemist. I have to give credit to this album for being a large stepping stone in my infatuation for hip-hop. It was one of those albums that came along and showed me that hip-hop wasn't dead. And that there are still some great musicians reviving the muddled commercial product of hip-hop. The lyrics are true to the soul, and it possesses a colorful and inventive production to match. Although, the production is a bit different from that of their critically acclaimed 2000 "Quality Control". The production wins points for intelligence and originality, but misses on the freshness that "Quality Control" had. Since the beats are a little darker, and a little more minimal, that just leaves more room to concentrate on four of the greatest tongue-twisters in hip-hop, which leaves little to complain about. 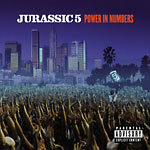 Jurassic 5 takes all the classic elements from the golden age of hip-hop and spins them into exciting and creative directions. Sure, it's what a lot of emcees and producers in hip-hop "try" to do; but the four emcees, DJ Nu-Mark and Cut Chemist simply possess the skills to get the job done. Take "Freedom" for example. The beats are very old-school and skeletal, but the flows, rhymes and messages are on point, which makes it a standout. "If You Only Knew" also contains one of their most important messages, which maps the trials and tribulations that they've gone through over the years. But I must say, "Break" is probably my favorite track, which is little more reminiscent of the production on "Quality Control"; it shines. The simple bass, guitar and drum loop has an infection build-up, which eventually breaks into some sweet scratching for a solid conclusion. Then comes the chorusless and hookless battle rhyming of "A Day at the Races" featuring Big Daddy Kane; very sweet. "What's Golden" (the "hit") has an infectious old-school feel to it, which definitely feels like a Jurassic 5 anthem. Next up is "Thin Line" featuring Nelly Furtado. I like some tunes by Furtado, but this one misses the mark, frankly. All and all, the album feels a bit front-loaded. Not to say that it isn't solid, but "Quality Control" was airtight. And subsequently, it's hard to create something as groundbreaking as their debut. There is still a ton of elements to love about this record. Some may be a little disappointed that the change in the formula came so quick, but that shouldn't shadow it's strong points. Nu-Mark and Cut Chemist really refine their production skills here, and you can expect the lyrics and flows to be incredible as always. But I would have to recommend "Quality Control" before this one. It's not that "Power In Numbers" misses the mark. It's just a bit dwarfed by their stunning debut. That certainly doesn't change their reputation of being among the most talented groups in hip-hop.